Google has released a new version of its measurement app via augmented reality (AR), called the ‘Measure’ that is compatible with the ARCore platform, including most recent flagships. For those unaware, Apple also has a similar AR measurement app for iPhones that too goes by the name ‘Measure’, which was introduced as a new feature in iOS 12. 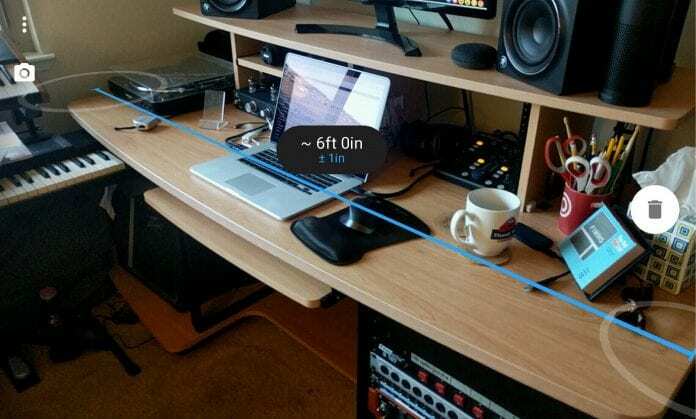 This feature allows users to measure real-world objects using AR on their phone. In fact, Google’s Measure app has been around for a long time although it was available only on Project Tango devices that had specialized sensors. The Measurement app helps in quick, everyday measurements around the house or office. It also helps in measuring the length and height of objects in the real world such as size of a rug, the width of a cabinet, or the height of a table. It allows you to switch between imperial and metric units, and save photos of measurements to your device for easy access later, which is helpful if you are in a furniture shop or hardware store. All you need to do is move your phone around the real-world object, and then drag a virtual line over the object you want to measure. So, how do you use the app? Firstly, download the app from the Play Store, and then launch it. On launching the app, it will ask you to grant various permissions and provide information on how to use the tool. It is worth noting that the Measure app works best in well-lit areas and textured surfaces. Once calibrated, a drawer at the bottom allows users to drag either a length or height tool into the camera viewfinder. The surfaces are highlighted with a grid of dots that the users can use to adjust the ends of the chosen tool in order to fine tune what’s being recorded. You will now be able to view the measurement of the object at the center of the blue or orange bar on your screen. Then, click a photo with the capture button in the top-right corner to save the measurement to your photo library. To know if your device is compatible with ARCore platform, click here. You can download the Measure app from the Play Store.